What is the Tula Probiotic Hydrating Day and Night Cream? What are its ups and downs? What’s our final thought on the face cream? Good hydration of skin throughout the entire day and night is just one of the things you need to take care for your skin. You should look for a face cream that manages to do that without making the T-zone too oily nor to leave a greasy feel on your skin. The solutions are many and various, but one that is based on natural ingredients is always the wise choice, for the obvious reasons. The Tula Probiotic Hydrating Day and Night Cream is able to improve your skin’s elasticity, to sooth inflammation and to moisturize day and night. Its well-thought formula is both appreciated by the specialists and liked by many out there, confirming its value. Hydrating deeply in order to rejuvenate the dull skin, the nourishing cream is made of naturally derived probiotics and superfoods, only to make your skin radiant and younger looking once again. You’d want to use the cream for reducing the visibility of fine lines and wrinkles, but also for increasing the suppleness of skin. 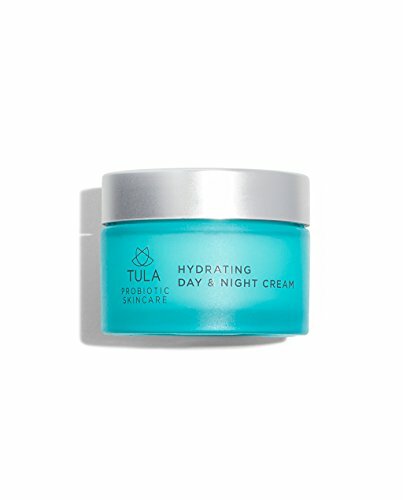 The face cream from Tula is in fact just like a multivitamin for your skin. It’s a moisturizing cream that fights aging of skin and its natural formula keeps your skin hydrated and flexible day and night. The main reason for the moisturizer’s efficiency is its formula that is based on natural ingredients that nourish the skin. Additionally, the formula doesn’t include any parabens, petrolatum, mineral oil, propylene, sulfates, gluten, glycol nor phthalates. It has never been tested on animals, so the face cream may satisfy the environmental fan too. Let’s take a close look at some of the main ingredients so that you can better understand why the cream is so hydrating and good for your skin. Milk protein-is very low in toxin hazards and allows maximum absorption. It calms the irritated and dry skin, hydrating and locking in the moisture of skin. It’s a great ingredient for the sensitive skin, but works for all skin types. It nourishes and heals the damaged skin too. Bifida Ferment Lysate-heals the skin damaged by the UVs. It hydrates the skin and sooths the skin. Yoghurt extract- increases the health of your skin and protects it from the outer stressors. The acid lactic within boosts the skin renewal process and improves the moisture balance in your skin. It makes your skin softer, suppler, more radiant, and younger looking too. Hydrolyzed rice protein-it sooths the irritated and allergy-prone skin. It seals in the moisture of skin and it’s naturally gluten-free. It improves the elasticity of skin and hydrates the skin. It smooths out the skin and makes it more flexible. Chicory root extract-reduces inflammation and is loaded with beta-carotene, which sustains the collagen production. It increases the elasticity of skin and reduces the fine lines and wrinkles. It plumps and hydrates the skin, making it look younger. It diminishes the damage of stressors to skin and fights the free radicals. It softens the skin and improves its well-being. Blueberry fruit extract- is loaded with vitamin C so it protects the skin by the UVs damage. It’s also rich in anthocyanins, keeping the development of skin cancer under control. The gallic acid within diminishes the damage of UV radiation to skin and the extract fights against aging of skin too. It has antioxidant abilities and protects the skin against the outer aggressors. Camellia sinensis leaf extract-minimizes inflammation in skin and fights against the aging of skin. Watermelon fruit extract-hydrates the skin and moisturizes it very well. It maintains the skin supple and toned, shrinking the skin tissues. It prevents the skin from aging as it’s loaded with antioxidants like vitamin C and A. It boosts the collage and elastin production and controls the oil production in skin too. It also keeps acne at bay. The list of ingredients doesn’t stop here and we’re going to let you find it all out on your own. You should include the face cream in your daily skin care routine, both in the morning and at night. Your skin should be well cleansed. The face cream is lightweight and goes well on skin. It has pretty smell and doesn’t weigh down your skin. It has a soft and creamy texture that is easily absorbed into the skin. We also like the cream as it doesn’t make the T-zone oily nor weighs down the skin. The face cream is nicely packaged, making a pleasant first impression. Loaded with numerous and efficient natural ingredients, the face cream hydrates and moisturizes the skin throughout the whole day and night and comes for a good price, considering its benefits to skin. Recent reviews on Sugar & Fluff Beauty: the BeeFriendly Face and Eye Moisturizer, the Image The Max Serum with VT, the Swiss Botany Dragons Blood, the Facial Moisturizer, Organic and Natural by Christina Moss, the Tata Harper Elixir Vitae Review.